I had hoped to get these two images posted before last weekend - when I had a couple shows to do and a trip to Albany to get to the second of the two - but things don't always go as planned. I've got a little breathing room this week - though I have a gallery Open House in Little Falls on Sunday, so will probably spend the balance of the week trying to pound out multiples in copper and silver of several of the chain maille designs you've already seen here. The image on top is another new one called Harvest Moon. Though I must tell you I found it nearly impossible to photograph the thing in a way that allows the viewer to discern the pattern. I even tried hanging it from a decorative hook inside my light cube. When viewed this way, it was easy to see the pattern - but then, like earrings when I try to snap a clear, unblurred image, it wouldn't stop swaying long enough to get the picture. It's a light weight, delicate design, though a little tricky to put together. The alternate name for the pattern is Tomato Sandwich, because - when held taut on both ends - the pattern reveals a series of rings "sandwiched" between two rings. The Harvest Moon aspect is also visible when the bracelet is held taut .. three inter-connected rings seem to represent a waxing or waning moon. 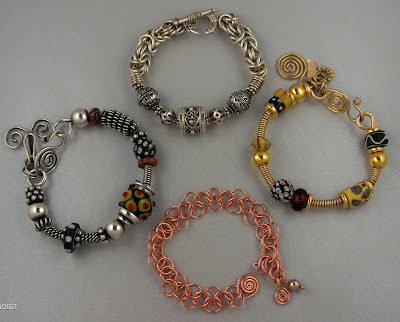 I took the second image in an attempt to get a quick representation of a variety of different types of wire bracelets I've been working on .. and hope to create as the design ideas flow (as I have a TON of beads, it's my Design Muse I'm waitin' for!!) The top bracelet is a variation of the Byzantine chain with the addition of some gorgeous, handmade Bali beads; the bottom is the Harvest Moon bracelet; and the two on the sides are "brangles" - a term coined by Connie Fox, one of those wonderfully creative jewelry folks out there willing to share their skills with the masses (brangle, of course, being a combination of bracelet and bangle). These are created using a large gauge wire core on which twisted wire, ancient trade beads, handmade lampwork glass beads, sterling, and various handmade and purchased charms and dangles are added or attached. They're best made to order, but I've found that, like regular beaded bracelets, there's an "average" size that fits most people. The good news for those who revel in their individuality is that these bracelets are usually one-of-a-kind. There is a solid sterling design which can be repeated; but when you're working with old trade beads and individually made glass lampwork beads, it's difficult to find two exactly alike. But then, this is what generally makes handcrafted artisan jewelry desirable. I stopped wanting to look like everyone else around age 16 ... when I finally decided that Karen spelled KarAn was pretty cool afterall. I'm like that with my jewelry, too. OK .. to explain the subject of this post, I must begin with the mundane: making and cleaning rings and finished bracelets. Wire is a pretty cool medium in which to work .. I haven't yet mastered it, but I get a little closer with every new project, tutorial and design. The task of winding rings on a mandrel and then cutting them is an assembly line kinda routine. I try to make as many as possible when I have all the devices set up to do it. Once I have a little pile of ring spirals, I go through the process of cutting them, suspending the cut rings on a piece of teardrop shaped copper that gets twisted at the top to hold them all on, and then dumping them all into my rotary tumbler with some steel shot, some water, ammonia and a drop of Dawn dishwashing liquid. Tumbling for an hour or two will both "work harden" them a little bit (as did the act of winding them onto a mandrel) and clean them up as well. After I've made a bracelet with the resulting rings, I dump the bracelets in and tumble them for another hour or two. Mostly because after handling the rings in the making of a bracelet they get a bit dull and a little marred. They always come out of the tumbler sparkling. I'll often toss one of my own solid sterling bracelets in along with new ones, just to clean them. 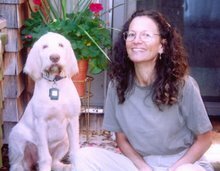 Just before the show on the 5th, I had several copper and several sterling bracelets I wanted to tumble for a bit and so dropped them all into the tumbler together with my usual solution, set the thing in motion, and went off to romp with the dog and run some lunch time errands. When I returned to the tumbler a couple hours later, my sterling bracelets would about blind ya, they were so bright n shiny. 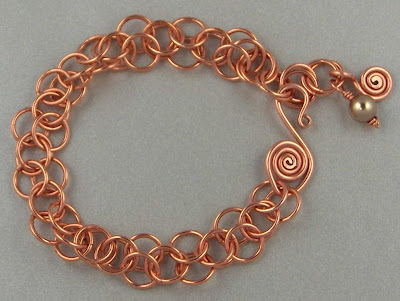 The copper bracelets, however, were no longer their lovely coppery color, but were totally washed out. Or at least that was my initial impression. What I had discovered I'd inadvertently done by putting both copper and sterling in the tumbler, together with ammonia, was to plate the copper with a thin layer of silver. Apparently the ammonia worked as an electrolyte. If I had tumbled the copper along with iron, it would have been the iron that would have emerged plated with copper. Something about Silver being more "nobel" than copper allowed a layer of silver to come off my sterling and overlay all the copper in the tumbler. So, instead of copper I now have some "silver toned" copper. Next to the sterling bracelets, they don't quite look like sterling ... and I have no idea how long the silver will last or how easy it will be for the silver to wear off. It will tarnish, however. I at first thought I might run them all through the tumbler again ... without the ammonia this time .. and see if I couldn't tumble them long enough to remove the layer of silver; but they're really kinda pretty the way they are. And at the copper price, you get what looks like a silver bracelet!! Who knew you could silver plate in a tumbler?!?! Kinda cool, kinda humorous .. but definitely a lesson learned!! Just so you know, silver is a "noble" metal. Not nobel. Nobel is the name of the guy who discovered what you might call TNT (dynamite) -- and from his name follows the Nobel Prize. As for the marvelous finding of plating ... nothing new ... it's done since ancient times. Just some basic chemistry or some wikipedia would give you some easy tips on the plating. Since many metals in this group are not corroded by oxygen, they are called "nobel metals" and are used in coinage and jewelry. Some in this group are slowly oxidized. The oxides formed are not very stable and can be decomposed by heating. As as for my discovery being "nothing new" .. perhaps so; but it was new to me. I was amazed. Still am. Having come from a beading background, I had no formal training in metallurgy.